Chemistry and Action of Herbicide Antidotes focuses on the development of herbicide safeners that promote high crop yields. 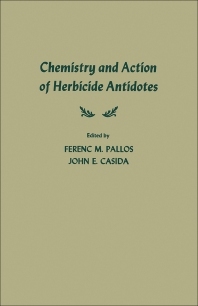 This book explores the chemical and biochemical basis for the further development of herbicide antidotes. Organized into six parts encompassing 11 chapters, this book begins with an overview of the development of a cheap, fast, and accurate detection method for herbicide antidotes. This text then discusses the screening procedures in antidote research, which include the crop, herbicide, and operation mechanics. Other chapters consider the desirable characteristics of EPTC herbicide, including low toxicity to wildlife and appropriateness for use in a crop rotation sequence. This text discusses as well the s-triazine herbicides that are widely used for pre-emergence and post-emergence selective weed control in agriculture. The final chapter deals with the various approaches to discovery and optimization of herbicide antidotes. This book is a valuable resource for weed scientists and herbicide specialists.